Cattle prices negatively affect Eighth District's overall farm income in 2016. Midwest and mid-South farm income and expenditures fell during the fourth quarter of 2016, according to the latest "Agricultural Finance Monitor" published by the Federal Reserve Bank of St. Louis, Mo. Meanwhile, quality farmland values and ranch or pasture land values also declined. The survey was conducted Dec. 15-31, 2016. The results were based on the responses of 34 agricultural banks located within the boundaries of the Eighth Federal Reserve District. The Eighth District comprises all or parts of the following seven states: Arkansas, Illinois, Indiana, Kentucky, Mississippi, Missouri and Tennessee. The survey also included three special questions that focused on farmland sales. Agricultural lenders continued to report lower farm income levels compared with a year earlier. Based on a diffusion index methodology with a base of 100 (results above 100 indicate higher income compared with the same quarter a year earlier; results lower than 100 indicate lower income), the diffusion index for farm income during the fourth quarter of 2016 fell to 39. This represents the 12th consecutive quarter in which the income index was below 100. Looking ahead to the first quarter of 2017, lenders’ farm income expectations remained low, with a diffusion index value of 41. “Cattle prices have negatively affected overall income for 2016. One large land-owning estate has liquidated some real estate in 2016, but I expect this to slow down in 2017,” an Arkansas lender reported. In conjunction with lower income levels and in line with the recent downward trend, fourth-quarter household spending and capital expenditures were lower than a year earlier. The household spending index came in at 77, while the capital spending index value was 45. Lenders said they also expect this trend to continue in the first quarter of 2017. After stabilizing in the third quarter, quality farmland values during the fourth quarter of 2016 were 8% lower than they were during the fourth quarter of 2015. Ranch land or pasture land values were 3.5% lower than a year ago. 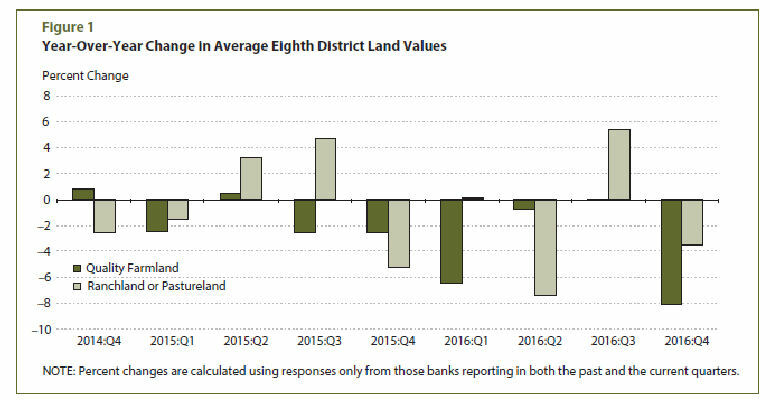 Meanwhile, lenders reported an 11.6% year-over-year decline in ranch land or pasture land cash rents and a 1.8% decline in quality farmland cash rents. “Most bankers expect further declines in the first quarter of 2017 as the diffusion indexes of land values and cash rents are below 100 for each type of agricultural land,” the report said. Due to reports of possible increases in farmland sales, the survey asked bankers three special questions to help characterize the farmland market in their respective areas. The first question asked lenders to choose -- from among four ranges of interest rates on fixed-rate farm real estate loans -- the rate range that would trigger a slowdown in farmland sales. Close to 25% of lenders said they thought rates would need to reach 5.5-6.0%; 22% said 6.0-6.5% and 25% said 6.5-7.0%. However, 28% said rates would need to rise above 7% before affecting farmland sales. The second question asked lenders how they think farmland sales will fare in 2017. Only 13% reported that they believe farmland sales volume will increase in 2017. Meanwhile, 63% of respondents expect no change, and 25% believe farmland sales will decrease. The third question asked bankers whether farmers remained the largest buyers of farmland in their respective areas in 2016. In response, 69% of the bankers reported that farmers bought more than 50% of the farmland, while 31% said farmers purchased less than 50%. “Hence, farmers remain the largest buyer group of (Eighth) District farmland,” the report said.